The sorrow of Sparrow: Where did Johnny Depp go? I would hardly classify myself as the biggest fan of Johnny Depp. However, I generally look forward to films featuring him because of his zany, wacky, and eccentric personality and acting. Depp used to do some rather daring and low-key films such as 2001’s Blow, a personal favorite of mine. He plays a cocaine dealer in that film. Two years later he would land the role that would forever define him, as far as I am concerned, “Captain” Jack Sparrow in 2003’s Pirates of the Caribbean: The Curse of the Black Pearl. And he’s been playing that character ever since, more or less. Don’t mistake me. I do love the Pirates films, or at least, the first two. After that, they kinda blur together and I lose track of them, but the first one was most certainly great. Nevertheless, there are many things I groan about when it comes to Hollywood such as unnecessary reboots and sequels, the overuse of bad CGI, cheesy dialogue, poor acting, the far too predictable rom-com, etc. However, there are two things in particular that have turned me away from movies that feature them and they both involve Johnny Depp: 1.) The continued collaboration between Johnny Depp and Tim Burton. 2.) When Johnny Depp plays the Jack Sparrow character. Let me add some context. Johnny Depp and director Tim Burton have collaborated on eight films together in a twenty-two year period. Some have been hugely successful (Edward Scissorhands, Charlie and the Chocolate Factory) and others have been duds, like the recent Dark Shadows collaboration, which only made $79 million at the domestic box office. Don’t get me wrong, financially and even critically, their collaboration has been met with incredible success. However, personally, I’m tired of seeing a new film involving these two. It’s time for something different. Moreover, in addition to the continued collaborations with Tim Burton, since 2003, I feel as if he’s essentially been playing the Jack Sparrow character in his big budget films such as Alice in Wonderland, Dark Shadows and the most recent film of his, The Lone Ranger. As my uncle quipped regarding the latter, he’s essentially Jack Sparrow on a horse in that film. I understand it. He’s been involved in two billion dollar films, a hugely popular series worldwide and there’s really no reason for him to go back to the independent scene and do something like Blow again. 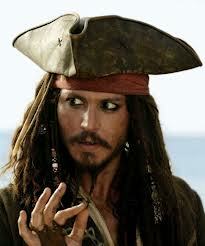 With a fifth Pirates film coming out in 2015, it doesn’t appear we’re done with Jack Sparrow any time soon either. I’ve grown weary of the eccentrics. I just want him to go back to the basics and act sans elaborate makeup, costumes and big set pieces. I’ve become estranged to the strange. Actually, I have yet to see that film of his. I’ll give it a look now since you’ve mentioned it, thanks!